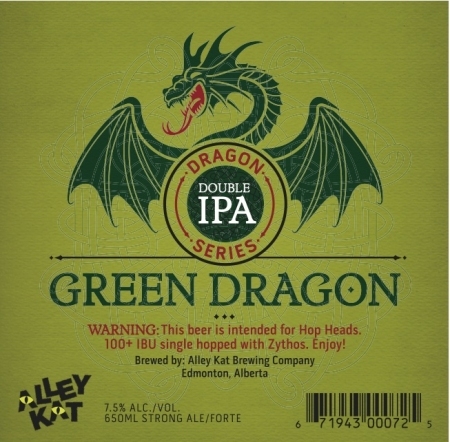 EDMONTON, AB – Inspired by the success of Red Dragon and Blue Dragon, a pair of double IPAs released last year as part of the Big Bottle series of one-off beers, Alley Kat Brewing has launched a new series dedicated exclusively to double IPAs, kicking it off with Green Dragon Double IPA. Green Dragon Double IPA is available now in 650 ml bottles at the brewery and in select liquor stores in Alberta. New installments in the series are planned to be released on a bi-monthly basis.